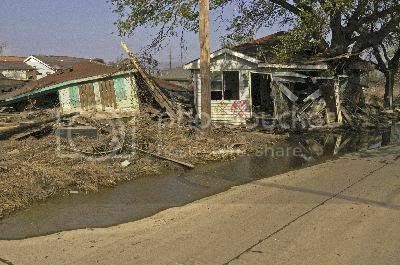 New Orleans residents who lost their homes in Hurricane Katrina were five times more likely to experience serious psychological distress a year after the disaster than those who did not. That's among the findings of a new study presented earlier this month at the annual meeting of the Population Association of America in New Orleans. The research was conducted by Narayan Sastry of the University of Michigan and Mark VanLandingham of Tulane University. They examined the mental health status of New Orleans' pre-Katrina residents one year after the disaster. Blacks reported much higher rates of serious psychological distress than whites. Almost one-third of blacks were found to have a high degree of distress, compared to just 6 percent of whites. Those with higher incomes and more education were much less likely to experience serious psychological distress, while those born in Louisiana were much more likely to suffer serious distress. "Our findings suggest that severe damage to one's home is a particularly important factor behind socioeconomic disparities in psychological distress, and possibly behind the levels of psychological distress," Sastry said. "These effects may be partly economic, because, for most families who own their home, home equity is the largest element of household wealth." The researchers note that severely damaged or destroyed housing may also prevent people from returning to their community, which in turn affects social ties and employment. Given the magnitude and permanence of a housing loss, they say, the psychological consequences of the experience could be profound and lasting.